24/01/12 - Paris - Art market - This afternoon, 24 January, a miniature with no minimum price representing the sculptor Houdon, signed and dated bottom left "M.G. CAPET AN 9" was to go on the auction block at the Hôtel Drouot, room 16, at the auctioneers Pescheteau-Badin. 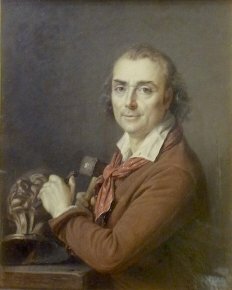 However, and the fact obviously caught the attention of several dealers and amateurs, it recalled a miniature painted by Marie-Gabrielle Capet, a student of Adélaïde Labille-Guiard, which had once been in the collections of the Musée in Caen where it was stolen in the 1920’s (see here the Joconde entry). Informed of the situation, the director of the Caen museum, Patrick Ramade, thought it was no doubt the same work which formerly belonged to his establishment and immediately alerted the Service des Musées de France which officially demanded the firm to withdraw it from the auction. During the exhibition preceding the sale, between 11 and 12 in the morning, the miniature had not yet been taken from the display as the size (about 15 x 12.5 cm.) is different from the one described on the Joconde database (13 x 10.6 cm.). This argument should be taken into account but is not necessarily determining proof, as the sizes in the databases, especially in the case of lost works, may at times be mistaken. All of the elements should be studied carefully before saying whether this portrait is indeed the one from the Caen museum or a different version. In any case, given the conditions in which the work was presented (sold as a simple framed work), it is either the one taken from the museum and should be returned or else it is not the same one, and finding its provenance will help in selling it under better conditions at a special auction with perhaps a catalog listing.